It's not like I didn't watch to watch this week's episode after disliking the last few so much; Doki was actually late with this release. Given that I'm a little bit curious about next week, I hope it's not delayed any further. This episode was finally the day of the concert, but it was anything but smooth sailing (as, otherwise, there really wouldn't be an episode). Due to unforeseen weather conditions, the focus was on the remaining idols instead of Ryuuguu Komachi. This also served as a method of redemption for Miki, as it was clear that she was trying her best to keep everything going. Typhoon warnings - a thing of the future. 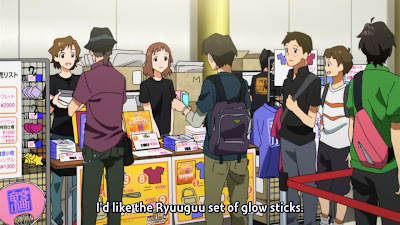 First of all, I used to herald Ritsuko as a person who knew what she was doing. As far as I know, typhoons are not sudden weather patterns that show up with only minutes of notice. Judging by the fact that she and the Ryuuguu Komachi idols were stuck waiting for the Shinkansen, I assume they were pretty far away. Why did they leave sunny and bright Tokyo on the day of a typhoon? The bad luck just continued, keeping the girls away from the concert until the very end of the episode. 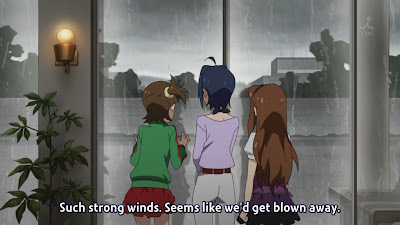 While I can't really blame things like a flat tire and a traffic jam on Ritsuko, I definitely want to know why she didn't have the foresight to at least check weather conditions on such an important day. 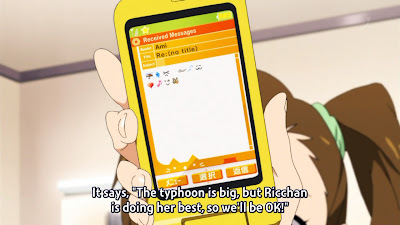 The girls were very worried about what would happen since Ryuuguu Komachi was so late. As they went through their rehearsal with excitement, there was definitely still a looming sense of worry. Producer made it clear that the concert wasn't getting cancelled, and that Ryuuguu Komachi would definitely show up. The girls decided that, until that time, they would do their best to hold on. 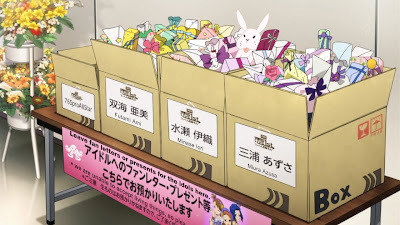 This is where Producer showed some signs of usefulness, working extremely hard with all of the crew in order to change the ordering of the songs so that the absence of Ryuuguu Komachi wasn't crippling. I don't understand where this strength and insight came from - most importantly, why has he been unable to channel it into something before this point? 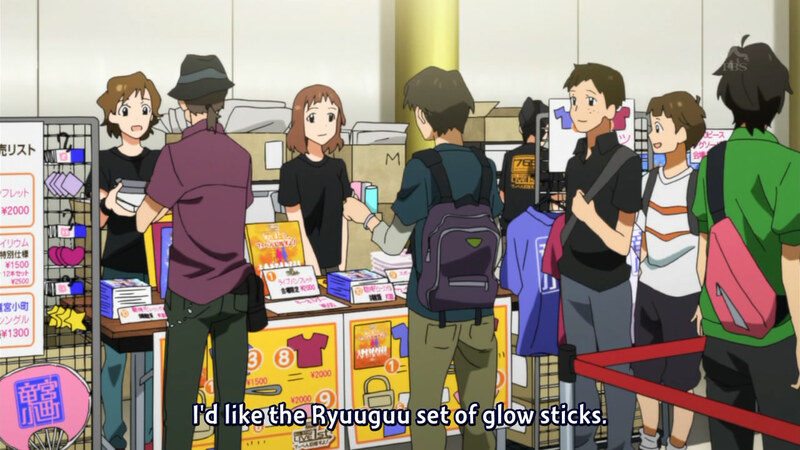 Doesn't Ryuuguu Komachi have female fans? The concert began late, when it became clear that no further delay was acceptable. It's interesting how the majority of the audience were boys. I genuinely wonder if they go for the bodies or if they actually enjoy the songs too. At any rate, the audience wasn't all that thrilled to not see Ryuuguu Komachi for a long period of time. 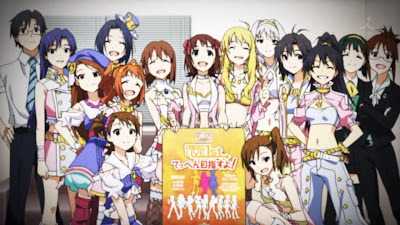 I questioned Producer's competence once again when it became apparent that the girls had been left in the dressing room without any supervision, leading to a lot of hectic running back and forth as they attempted to band together and keep everything going well. This is what happens when there's no leader. That makes me feel a little sad for all the other girls. Eventually, the emotions ran too high and the girls butted heads. Mami accidentally ripped Yukiho's skirt while struggling to get it zipped up, while Makoto's uncapped drink spilled all over Hibiki's costume. This would have been a good time for Producer to shine but, as usual, he came in as the girls were finishing up their pep talks to each other. I swear, I just want to see him do something worthy of his position one of these days. He seems to be good at the organizer stuff - talking to all the crew in order to make sure that everything was going on-track - but fails in actually promoting the idols. Why is he the producer? I guess smaller costumes make sense, considering the hot lights. 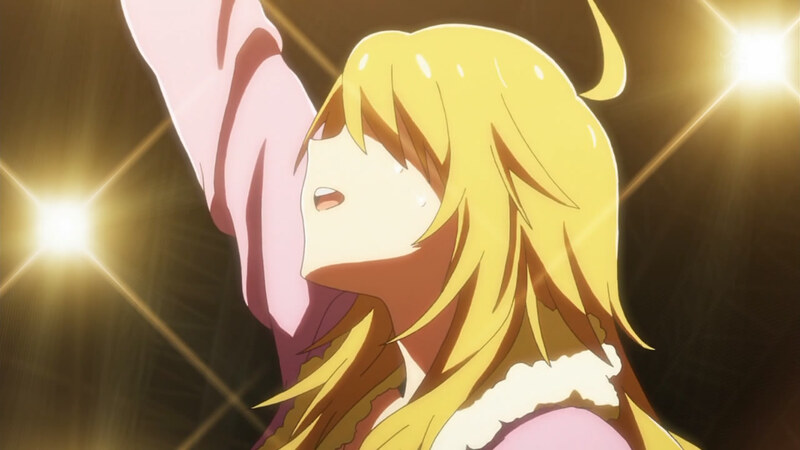 Eventually, it came to that the new changes had placed two of Miki's song back-to-back, which would cause a huge stress on her. I dislike it when such contrived things happen, but I can see how it must have occurred; Producer is pretty incompetent as a whole. 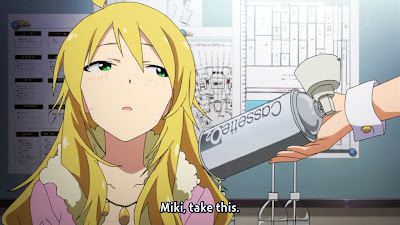 At any rate, Miki wanted to try to do it, even though it would mean that she would be extremely tired afterwards, and Producer allowed her, sending Hibiki and Makoto to back her up (and to mask her errors, I suppose). She began her segment by telling the crowd honestly that Ryuuguu Komachi was delayed due to the typhoon, but they would definitely be there. (You'd think someone would have told them before that point, unless it's protocol, for some reason, to not do that.) And, then, of course, her performance went quite well and the crowd loved her. I have never seen something like this before. Ryuuguu Komachi ran in just as the girls were performing an all-cast song to a rather vibrant and excited audience. While Miki had collapsed (into Producer's arms, of course) earlier after her double performance, she had regained her strength and the concert had gone spectacularly. It was pretty obvious that this episode tried its best to stay away from Ryuuguu Komachi, since the camera panned to the sky and shifted scenes just as they began performing Smoky Thrill. Afterwards, the girls dashed to the dressing room only to find that all the other idols had fallen asleep, due to extreme tiredness. They look pretty good together. 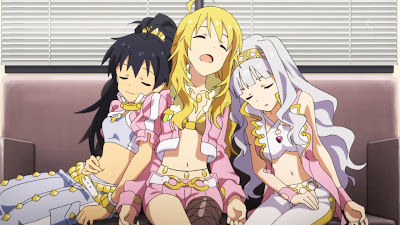 One thing of note that I found quite interesting was that Takane, Miki and Hibiki had fallen asleep while supporting each other. As I began to dislike this anime so much, I looked into its origins further. The story is so amazingly different that I felt kind of sad that the anime destroyed so much of it. There's a very good chance that these stories weren't interesting in the games, as there's a chance it wasn't fleshed out properly and rather just used as various plot devices, but just the quality of the concepts themselves makes me curious. Takane, Miki and Hibiki were originally part of Studio 961, as a unit known as Project Fairy. (This is, by the way, the same production that handles Project Jupiter; apparently, they like themed names.) They eventually left to become a part of 765 Productions; I don't know if their grouping was retained or not. I don't know where the anime picks up, since they've never referenced any of this; it would be either after this change happened or it's set in a completely different universe. As well, Mami and Ami were once marketed as one person, under Ami's name, and then they were introduced as two different idols and Mami decided to grow her hair out. These kinds of back stories might have made me like the entire situation a lot more. As it is now, everything just feels really hollow sometimes. I must say, Ryuuguu Komachi's costumes look a little ridiculous. 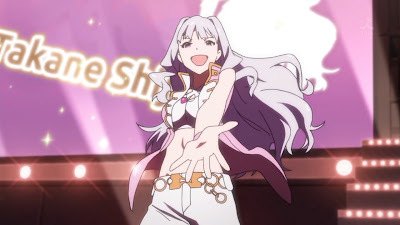 The next episode looks interesting, if simply because Takane is wearing an apple costume. (I'm such a sucker for these things.) For now, she's my favourite character - however, keeping in mind what Miki turned out to be like, I'm a little wary.